Islamic architecture can easily be identified among other architectural styles; you do not even need an extensive knowledge in architecture to recognize it! Islamic design incorporates some very distinctive features such as geometric patterns and rich ornaments. As distinctive and distinguished as it is, no style has ever been created without an influence from predecessor styles. And Islamic architecture is no exception. It was somehow influenced by Persian and Indian architectures. There are four primary Islamic architectural types, the Mosque, the Tomb, the Palace and the Fort. Other buildings built in this style are often structured after one of these four types. Various structures, secular, religious and more, have been built in this style from the foundation of Islam to the present day. Nonetheless, because mosques are the most renowned examples of Islamic architecture, some other gorgeous examples often get overlooked. Let’s go beyond the widespread here and take a look at some of the most striking examples of Islamic architecture other than mosques. 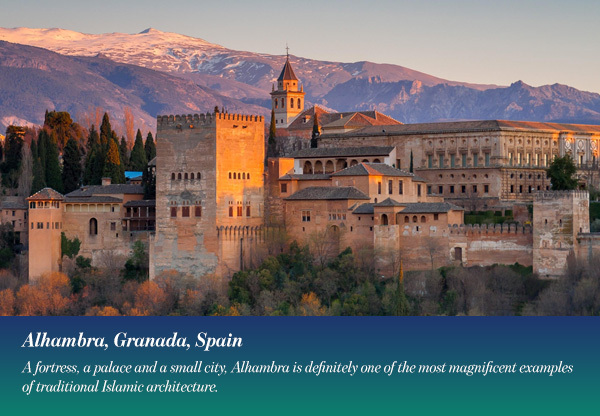 A fortress, a palace and a small city, Alhambra is definitely one of the most magnificent examples of traditional Islamic architecture. Alhambra fortress and residence spectacularly shows the Nasrid art in its architecture and design; The Nasrid dynasty, and the era in which they ruled Andalusia created the most epic and lavish period within Spanish Islamic art. Typical Islamic style is clearly shown in this structure; all surfaces in the design are covered with complex ornamental patterns such as calligraphic inscriptions and geometric patterns. The main architectural features in the Al Hambra are ceramic mosaics, plasterwork and carved wooden ceilings, all of which are abundantly decorated. The distinguished Nasrid plasterwork covers walls, arches plasterwork, vaults and ceilings, the intricate ornamental design and vibrant colors give them a rich look that resembles textile in its detailing. Al Hambra and its adjacent garden, Genaralife, have been listed by the UNESCO as a world heritage site in 1984. In 1994, Albayzin, the residential district adjacent to the site, was added. Albayzin, or Albaycín is another magnificent example where Islamic architecture blends with Spanish architecture to form the spectacular Andalusian architecture. 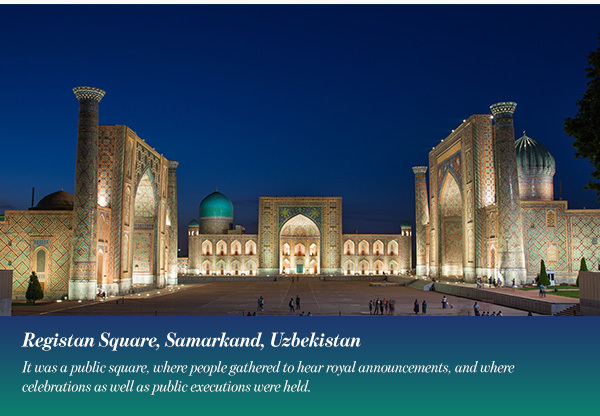 In the old days, Registan Square was the beating heart of the ancient city of Samarkand. It was a public square, where people gathered to hear royal announcements, and where celebrations as well as public executions were held. Later on, the square was framed by three madrasahs, Arabic for schools, that were built with the most beautiful and unique Islamic architecture. The three madrasahs are the Ulugh Beg Madrasah, the Tilla-Kari Madrasah and the Sher-Dar Madrasah. They were built in The Registan in that respective order. Due to many damaging factors, The Registan was more or less destroyed. However, years of painstaking restoration work brought it back to life. Today, the ancient city of Samarkand is a UNESCO world heritage site. Thousands of tourists fly every day to the beautiful old city to check its marvelous architecture. And the registan square now holds all sorts of concerts, celebrations and events. 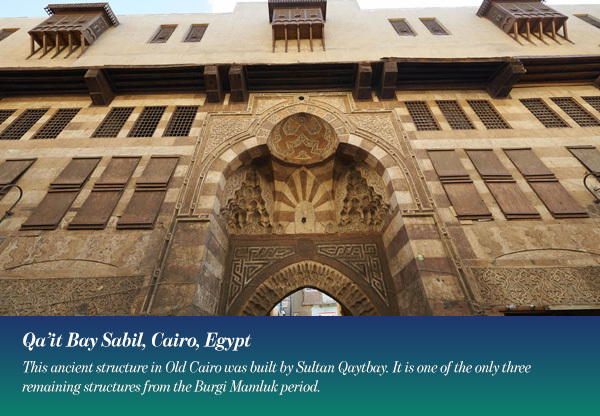 This ancient structure in Old Cairo was built by Sultan Qaytbay. It is one of the only three remaining structures from the Burgi Mamluk period. The wikala, which includes the Sabil, has an intricately carved stone facade. It features a magnificent entry decorated with muqarnas and an inscription band, with fourteen shops located to either side of the entry. The interior courtyard has disappeared after all the construction the area has gone through over the years, as well as the second floor. The ground floor however is still inhabited, and the northern perimeter is still mostly intact as well as the facade of the second floor. The Sabil, which is the Arabic name for the drinking fountain, sits at the western side of the wikala. It is remarkably large for a Sabil and features outstanding carved stone details. The broad facade is made up of a cornucopia of marble patterns – waves of water, triangles, squares, circles and stars. The mosaic of ornaments and details complement each other harmoniously. Even though the Sabil is waterless, the Egyptian Antiquities Organization has restored and scrubbed the exterior, so it looks pretty fresh. Suspended over a natural rock formation in Wadi Dhahr Valley, Dar al Hajar or Stone Palace seems to have grown out of the rocks. The house is located 14 km from the capital Sanaa, and it is one of the most renowned landmarks in Yemen. It was built by one of the most brilliant Arab architects. Ali bin Saleh Al-Amari (1736-1798), the well-known scholar, cleric, scientist, poet, rhetorician, and intellectual, has built this house in the 18th century. Despite his vast interests, he excelled in architectural engineering, his masterpiece, Dar Al-Hajar can attest to that. The beautiful Islamic architecture can be noticed in the details painted and carved around the windows and edges of the house. This iconic symbol for Yemen was restored by the Government and it is now open for visitors. 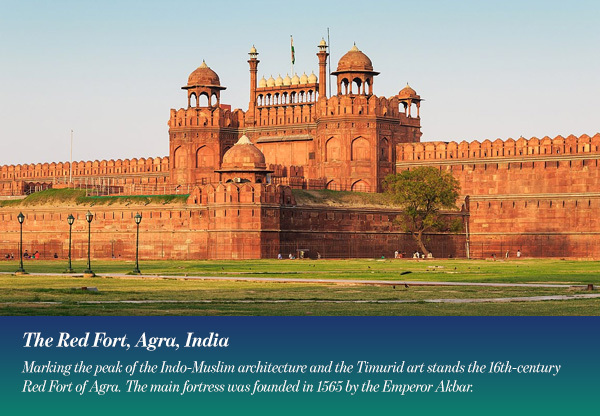 Marking the peak of the Indo-Muslim architecture and the Timurid art stands the 16th-century Red Fort of Agra. The main fortress was founded in 1565 by the Emperor Akbar. Later on, Shah Jahan added several structures to the fort, as well as the adjacent Taj Mahal with its marvelous surrounding gardens. The fort comprises several splendid palaces, such as the Jahangir Palace and the Khas Mahal, built by Shah Jahan. Several of the structures in this Mughal monument are made from pure marble with beautiful intricate carvings. The Red Fort of Agra is beautifully preserved; you can almost see the luxurious life of its inhabitants moving around you. A testimony to how well it was designed and built. The Fort is a UNESCO world heritage site.